You are the one in charge of your financial situation. When changes need to be made, you must be the one to make them. If something isn’t working, you must be the one to make a change. 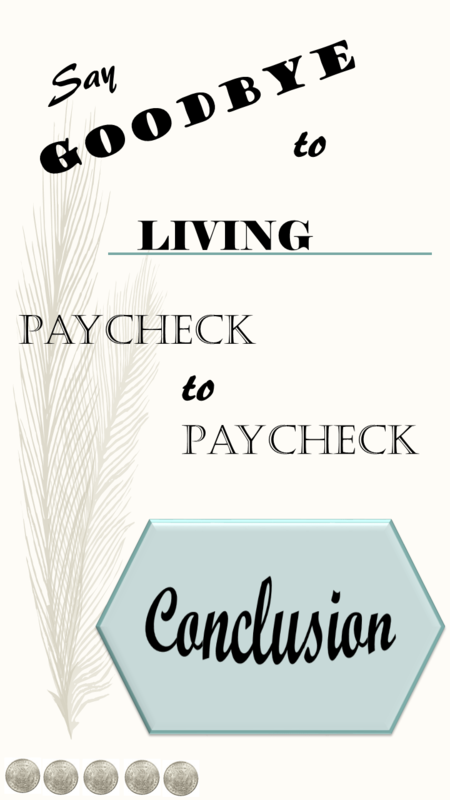 Living paycheck to paycheck is a stressful situation that everyone can get out of. You must begin by analyzing your situation and creating a plan. If you find that there are not enough funds to cover your basic needs, make a change. It’s scary to enter the job market but if your paychecks aren’t keeping a roof over your head, it’s time to move on. If you find that your paychecks seem reasonable but they just don’t seem to be enough, look at your spending where you can cut back. Chances are, there are quite a bit of unnecessary purchases. When taking the steps towards saying goodbye to living paycheck to paycheck, it is better to air on the side of caution. Take a few months and don’t spend any ‘fun money’. See how much money it takes to cover the ‘needs’ and not the wants. Once you are comfortable with your budget and you’re able to start saving, then bring in a few more of the wants. This is a great way to reward your accomplishments and keep you on track. All it takes is dedication and discipline for you to Say Goodbye to Living Paycheck to Paycheck. Lots of good information in this series! I’m definitely walking away with a few tips and tricks to better my own financial situations. Thanks for the help! It’s so hard to stick to your financial goals sometimes but it is so worth it! You learn to live with less and feel more satisfied with the money you saved. This post seriously is perfect. There is so much information in here to help with any financial situation. Totally bookmarking this. Thank you for sharing. I completely agree with you when it comes to cutting out “the fun money”. It’s a real eye opener to see how much really goes to that specific purpose! I find that it really makes me see what the necessities are, and take it from there. I am going to have to take some of your tips. We don’t live paycheck to paycheck, but we do struggle sometimes. It would be nice to not have to worry about that. I have been trying to cut back myself while I’m trying to save for my upcoming wedding. Lots of the “fun” things are getting set aside until after. All these fun things will still be there.